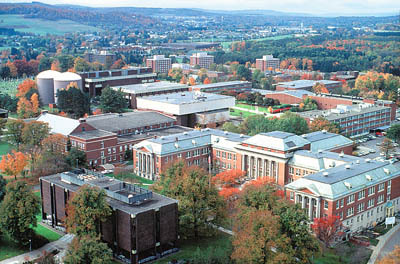 The catalog for the State University of New York College at Cortland is published by the Division of Institutional Advancement. This edition covers undergraduate programs for the 2017-18 academic year. Information in it is accurate as of June 2017. Circumstances may require that a given course be withdrawn or that alternate offerings be made. Names of instructors for courses and days and times of class sessions are given in the Course Schedule available to students prior to the official registration period. Inquiries also may be directed to the United States Department of Education's Office for Civil Rights, 32 Old Slip 26th Floor, New York, NY 10005-2500, 646-428-3800, OCR.NewYork@ed.gov. Inquiries pertaining to the laws, regulations and College policies prohibiting all types of discrimination or claims of discrimination or harassment may be referred to Dawn Norcross, affirmative action officer, Miller Building, Room 301, 607-753-2302.